The information and links below will assist you in preparing your manuscript for submision. Please direct questions regarding a specific ASA journal to the journal's editorial office. Journal specific submission guidelines can be found on individual journal pages. 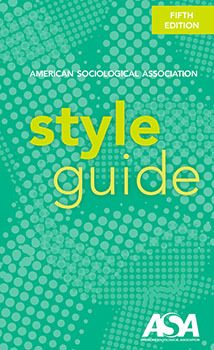 The fifth edition of the ASA Style Guide is the authoritative reference for writing, submitting, editing, and copyediting manuscripts for ASA journals and other publications following ASA's unique format. This revised, expanded edition features guidelines for the most common situations encountered by authors and editors. New features include revisions to reference formatting and additional information on grammar. In addition, updated reference examples, including citing social media sources and journal articles posted online ahead of print, are included in this new edition. ASA has launched the new Publishing Options database, exclusively available to members in the "My ASA" member portal. (Use your ASA user name and password to log in.) The database includes listings for more than 200 journals accepting manuscripts in sociology or closely-related fields (including 18 open-access journals). Members may search by journal title, specialty areas, types of manuscripts accepted, publisher, or open-access format.